Proprietary Name: Insulin Lispro What is the Proprietary Name? Non-Proprietary Name: Insulin Lispro What is the Non-Proprietary Name? Insulin Lispro with NDC 66733-773 is a a human prescription drug product labeled by Imclone Llc. The generic name of Insulin Lispro is insulin lispro. The product's dosage form is injection, solution and is administered via intravenous; subcutaneous form. FDA Application Number: NDA020563 What is the FDA Application Number? Insulin lispro is a rapid acting human insulin analog indicated to improve glycemic control in adults and children with diabetes mellitus. Inspect insulin lispro visually before use. It should appear clear and colorless. Do not use insulin lispro if particulate matter or coloration is seen. Use Insulin Lispro KwikPens with caution in patients with visual impairment that may rely on audible clicks to dial their dose. Do NOT mix insulin lispro U-100 with other insulins when administering using a continuous subcutaneous infusion pump. Do NOT transfer insulin lispro U-200 from the KwikPen to a syringe for administration [see Warnings and Precautions (5.4)]. Do NOT perform dose conversion when using any Insulin Lispro U-100 or U-200 KwikPens. The dose window shows the number of insulin units to be delivered and no conversion is needed.Do NOT mix insulin lispro U-200 with any other insulins. Do NOT administer insulin lispro U-200 using a continuous subcutaneous infusion pump (i.e., insulin pump). Do NOT administer insulin lispro U-200 intravenously. Subcutaneous Injection: Insulin Lispro U-100 or U-200Administer the dose of insulin lispro U-100 or insulin lispro U-200 within fifteen minutes before a meal or immediately after a meal by injection into the subcutaneous tissue of the abdominal wall, thigh, upper arm, or buttocks. To reduce the risk of lipodystrophy, rotate the injection site within the same region from one injection to the next [see Adverse Reactions (6)]. Insulin lispro administered by subcutaneous injection should generally be used in regimens with an intermediate- or long-acting insulin. The Insulin Lispro U-100 KwikPen and Insulin Lispro U-200 KwikPen each dial in 1 unit increments. The Insulin Lispro U-100 Junior KwikPen dials in 0.5 unit increments. Continuous Subcutaneous Infusion (Insulin Pump): Insulin Lispro U-100 ONLYDo NOT administer insulin lispro U-200 using a continuous subcutaneous infusion pump. Administer insulin lispro U-100 by continuous subcutaneous infusion into the subcutaneous tissue of the abdominal wall. Rotate infusion sites within the same region to reduce the risk of lipodystrophy [see Adverse Reactions (6.1)]. Follow healthcare professional recommendations when setting basal and meal time infusion rate. Do NOT dilute or mix insulin lispro U-100 when administering by continuous subcutaneous infusion. Change insulin lispro U-100 in the pump reservoir at least every 7 days. Do NOT expose insulin lispro U-100 in the pump reservoir to temperatures greater than 98.6°F (37°C). Use insulin lispro U-100 in pump systems suitable for insulin infusion [see Patient Counseling Information (17.7)]. Intravenous Administration: Insulin Lispro U-100 ONLYDo NOT administer insulin lispro U-200 intravenously. Dilute insulin lispro U-100 to concentrations from 0.1 unit/mL to 1.0 unit/mL using 0.9% sodium chloride. Administer insulin lispro U-100 intravenously ONLY under medical supervision with close monitoring of blood glucose and potassium levels to avoid hypoglycemia and hypokalemia [see Warnings and Precautions (5.3, 5.6) and How Supplied/Storage and Handling (16.4)]. Individualize and adjust the dosage of insulin lispro based on route of administration, the individual's metabolic needs, blood glucose monitoring results and glycemic control goal. Dosage adjustments may be needed with changes in physical activity, changes in meal patterns (i.e., macronutrient content or timing of food intake), changes in renal or hepatic function or during acute illness [see Warnings and Precautions (5.2, 5.3) and Use in Specific Populations (8.6, 8.7)]. Do NOT perform dose conversion when using any Insulin Lispro U-100 or U-200 KwikPens. The dose window shows the number of insulin units to be delivered and no conversion is needed. Dosage adjustment may be needed when insulin lispro is coadministered with certain drugs [see Drug Interactions (7)]. Dosage adjustment may be needed when switching from another insulin to insulin lispro [see Warnings and Precautions (5.2)]. Instructions for Mixing with Other InsulinsInsulin lispro U-100 subcutaneous injection routeInsulin lispro U-100 may be mixed with NPH insulin preparations ONLY. If insulin lispro U-100 is mixed with NPH insulin, insulin lispro U-100 should be drawn into the syringe first. Injection should occur immediately after mixing. Insulin lispro U-100 continuous subcutaneous infusion route (Insulin Pump)Do NOT mix insulin lispro U-100 with any other insulin. Insulin lispro U-200 subcutaneous injection routeDo NOT mix with any other insulin. In patients who are hypersensitive to insulin lispro or to any of its excipients. 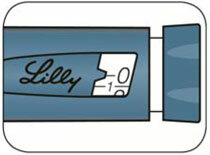 Insulin Lispro KwikPens, cartridges, and reusable pens compatible with Lilly 3 mL cartridges must never be shared between patients, even if the needle is changed. Patients using insulin lispro vials must never share needles or syringes with another person. Sharing poses a risk for transmission of blood-borne pathogens. Changes in insulin strength, manufacturer, type, or method of administration may affect glycemic control and predispose to hypoglycemia [see Warnings and Precautions (5.3)] or hyperglycemia. These changes should be made cautiously and under close medical supervision and the frequency of blood glucose monitoring should be increased. Hypoglycemia is the most common adverse reaction associated with insulins, including insulin lispro. Severe hypoglycemia can cause seizures, may be life-threatening, or cause death. Hypoglycemia can impair concentration ability and reaction time; this may place an individual and others at risk in situations where these abilities are important (e.g., driving or operating other machinery). Risk Factors for HypoglycemiaThe risk of hypoglycemia after an injection is related to the duration of action of the insulin and, in general, is highest when the glucose lowering effect of the insulin is maximal. As with all insulin preparations, the glucose lowering effect time course of insulin lispro may vary in different individuals or at different times in the same individual and depends on many conditions, including the area of injection as well as the injection site blood supply and temperature [see Clinical Pharmacology (12.2)]. Other factors which may increase the risk of hypoglycemia include changes in meal pattern (e.g., macronutrient content or timing of meals), changes in level of physical activity, or changes to co-administered medication [see Drug Interactions (7)]. Patients with renal or hepatic impairment may be at higher risk of hypoglycemia [see Use in Specific Populations (8.6, 8.7)]. Risk Mitigation Strategies for HypoglycemiaPatients and caregivers must be educated to recognize and manage hypoglycemia. Self-monitoring of blood glucose plays an essential role in the prevention and management of hypoglycemia. In patients at higher risk for hypoglycemia and patients who have reduced symptomatic awareness of hypoglycemia, increased frequency of blood glucose monitoring is recommended. Hypoglycemia [see Warnings and Precautions (5.3)]. Hypokalemia [see Warnings and Precautions (5.6)]. Insulin initiation and intensification of glucose controlIntensification or rapid improvement in glucose control has been associated with a transitory, reversible ophthalmologic refraction disorder, worsening of diabetic retinopathy, and acute painful peripheral neuropathy. However, long-term glycemic control decreases the risk of diabetic retinopathy and neuropathy. LipodystrophyLong-term use of insulin, including insulin lispro, can cause lipodystrophy at the site of repeated insulin injections or infusion. Lipodystrophy includes lipohypertrophy (thickening of adipose tissue) and lipoatrophy (thinning of adipose tissue), and may affect insulin absorption. Rotate insulin injection or infusion sites within the same region to reduce the risk of lipodystrophy [see Dosage and Administration (2.2)]. Weight gainWeight gain can occur with insulin therapy, including insulin lispro, and has been attributed to the anabolic effects of insulin and the decrease in glucosuria. Peripheral EdemaInsulin, including insulin lispro, may cause sodium retention and edema, particularly if previously poor metabolic control is improved by intensified insulin therapy. Adverse Reactions with Continuous Subcutaneous Insulin Infusion (CSII) — Insulin Lispro U-100In a 12-week, randomized, crossover study in adult patients with type 1 diabetes (n=39), the rates of catheter occlusions and infusion site reactions were similar for insulin lispro U-100 and regular human insulin treated patients (see Table 3). In a randomized, 16-week, open-label, parallel design study of children and adolescents with type 1 diabetes, adverse event reports related to infusion-site reactions were similar for insulin lispro and insulin aspart (21% of 100 patients versus 17% of 198 patients, respectively). In both groups, the most frequently reported infusion site adverse events were infusion site erythema and infusion site reaction. Local Allergy — As with any insulin therapy, patients taking insulin lispro may experience redness, swelling, or itching at the site of the injection. These minor reactions usually resolve in a few days to a few weeks, but in some occasions, may require discontinuation of insulin lispro. In some instances, these reactions may be related to factors other than insulin, such as irritants in a skin cleansing agent or poor injection technique. Systemic Allergy — Severe, life-threatening, generalized allergy, including anaphylaxis, may occur with any insulin, including insulin lispro. Generalized allergy to insulin may cause whole body rash (including pruritus), dyspnea, wheezing, hypotension, tachycardia, or diaphoresis. In controlled clinical trials, pruritus (with or without rash) was seen in 17 patients receiving regular human insulin (n=2969) and 30 patients receiving insulin lispro (n=2944). Localized reactions and generalized myalgias have been reported with injected metacresol, which is an excipient in insulin lispro [see Contraindications (4)]. Antibody ProductionIn large clinical trials with patients with type 1 (n=509) and type 2 (n=262) diabetes mellitus, anti-insulin antibody (insulin lispro-specific antibodies, insulin-specific antibodies, cross-reactive antibodies) formation was evaluated in patients receiving both regular human insulin and insulin lispro (including patients previously treated with human insulin and naive patients). As expected, the largest increase in the antibody levels occurred in patients new to insulin therapy. The antibody levels peaked by 12 months and declined over the remaining years of the study. These antibodies do not appear to cause deterioration in glycemic control or necessitate an increase in insulin dose. There was no statistically significant relationship between the change in the total daily insulin dose and the change in percent antibody binding for any of the antibody types. Insulin Lispro U-100The following additional adverse reactions have been identified during post-approval use of insulin lispro. Because these reactions are reported voluntarily from a population of uncertain size, it is not always possible to reliably estimate their frequency or establish a causal relationship to drug exposure. Medication errors in which other insulins have been accidentally substituted for insulin lispro have been identified during postapproval use [see Patient Counseling Information (17.4)]. Intravenous Administration of Insulin Lispro U-100 — The glucose lowering effect of intravenously administered insulin lispro was tested in 21 patients with type 1 diabetes. For the study, the patients' usual doses of insulin were held and blood glucose concentrations were allowed to reach a stable range of 200 to 260 mg/dL during a one to three hours run-in phase. The run-in phase was followed by a 6-hour assessment phase. During the assessment phase, patients received intravenous insulin lispro at an initial infusion rate of 0.5 units/hour. The infusion rate of insulin lispro could be adjusted at regular timed intervals to achieve and maintain blood glucose concentrations between 100 to 160 mg/dL. The mean blood glucose levels during the assessment phase for patients on insulin lispro therapy are summarized below in Table 4. All patients achieved the targeted glucose range at some point during the 6-hour assessment phase. At the endpoint, blood glucose was within the target range (100 to 160 mg/dL) for 17 of 20 patients treated with insulin lispro. The average time (±SE) required to attain near normoglycemia was 129 ± 14 minutes for insulin lispro. The pharmacodynamics of a single 20 unit dose of insulin lispro U-200 administered subcutaneously were compared to the pharmacodynamics of a single 20 unit dose of insulin lispro U-100 administered subcutaneously in a euglycemic clamp study enrolling healthy subjects. In this study, the overall, maximum, and time to maximum glucose lowering effect were similar between insulin lispro U-200 and insulin lispro U-100. The mean area under the glucose infusion rate curves (measure of overall pharmacodynamic effect) were 125 g and 126 g for insulin lispro U-200 and insulin lispro U-100, respectively. The maximum glucose infusion rate was 534 mg/min and 559 mg/min and the corresponding median time (min, max) to maximum effect were 2.8 h (0.5 h – 6.3 h) and 2.4 h (0.5 h – 4.7 h) for insulin lispro U-200 and insulin lispro U-100, respectively. 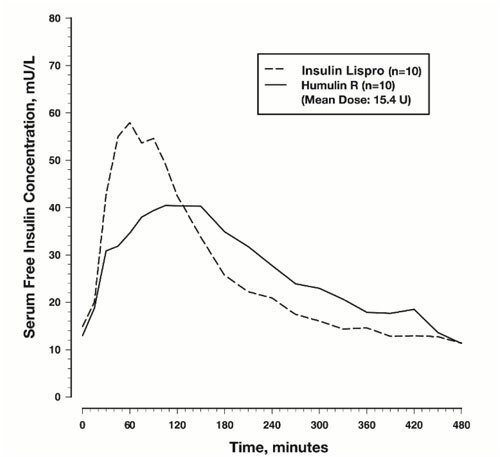 Figure 2: Serum Insulin Lispro and Insulin Levels After Subcutaneous Injection of Regular Human Insulin or Insulin Lispro (0.2 unit/kg) Immediately Before a High Carbohydrate Meal in 10 Patients with Type 1 Diabetesa. a Baseline insulin concentration was maintained by infusion of 0.2 mU/min/kg human insulin. Insulin lispro U-100 was absorbed at a consistently faster rate than regular human insulin in healthy male volunteers given 0.2 unit/kg at abdominal, deltoid, or femoral subcutaneous sites. After insulin lispro was administered in the abdomen, serum drug levels were higher and the duration of action was slightly shorter than after deltoid or thigh administration. Bioavailability of insulin lispro is similar to that of regular human insulin. The absolute bioavailability after subcutaneous injection ranges from 55% to 77% with doses between 0.1 to 0.2 unit/kg, inclusive. The results of a study in healthy subjects demonstrated that insulin lispro U-200 is bioequivalent to insulin lispro U-100 following administration of a single 20 unit dose. 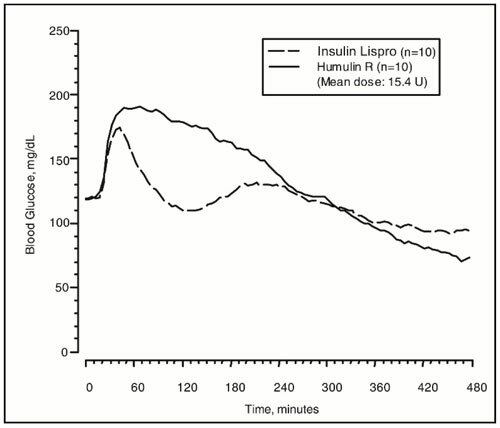 The mean observed area under the serum insulin concentration-time curve from time zero to infinity was 2360 pmol hr/L and 2390 pmol hr/L for insulin lispro U-200 and insulin lispro U-100, respectively. The corresponding mean peak serum insulin concentration was 795 pmol/L and 909 pmol/L for insulin lispro U-200 and insulin lispro U-100, respectively. The median time to maximum concentration was 1.0 hour for both formulations. Distribution — When administered intravenously as bolus injections of 0.1 and 0.2 U/kg dose in two separate groups of healthy subjects, the mean volume of distribution of insulin lispro appeared to decrease with increase in dose (1.55 and 0.72 L/kg, respectively) in contrast to that of regular human insulin for which, the volume of distribution was comparable across the two dose groups (1.37 and 1.12 L/kg for 0.1 and 0.2 U/kg dose, respectively). Metabolism — Human metabolism studies have not been conducted. However, animal studies indicate that the metabolism of insulin lispro is identical to that of regular human insulin. Elimination — After subcutaneous administration of insulin lispro, the t1/2 is shorter than that of regular human insulin (1 versus 1.5 hours, respectively). When administered intravenously, insulin lispro and regular human insulin demonstrated similar dose-dependent clearance, with a mean clearance of 21.0 mL/min/kg and 21.4 mL/min/kg, respectively (0.1 unit/kg dose), and 9.6 mL/min/kg and 9.4 mL/min/kg, respectively (0.2 unit/kg dose). Accordingly, insulin lispro demonstrated a mean t1/2 of 0.85 hours (51 minutes) and 0.92 hours (55 minutes), respectively for 0.1 unit/kg and 0.2 unit/kg doses, and regular human insulin mean t1/2 was 0.79 hours (47 minutes) and 1.28 hours (77 minutes), respectively for 0.1 unit/kg and 0.2 unit/kg doses. Specific PopulationsThe effects of age, gender, race, obesity, pregnancy, or smoking on the pharmacokinetics of insulin lispro have not been studied. Renal Impairment — Type 2 diabetic patients with varying degree of renal impairment showed no difference in pharmacokinetics of regular insulin and insulin lispro. However, the sensitivity of the patients to insulin did change, with an increased response to insulin as the renal function declined. Some studies with human insulin have shown increased circulating levels of insulin in patients with renal impairment. Careful glucose monitoring and dose adjustments of insulin, including insulin lispro, may be necessary in patients with renal dysfunction. Hepatic Impairment — Type 2 diabetic patients with impaired hepatic function showed no effect on the pharmacokinetics of insulin lispro as compared to patients with no hepatic dysfunction. However, some studies with human insulin have shown increased circulating levels of insulin in patients with liver failure. Careful glucose monitoring and dose adjustments of insulin, including insulin lispro, may be necessary in patients with hepatic dysfunction. Use in an External Insulin Pump — Change the insulin lispro U-100 in the reservoir at least every 7 days, change the infusion sets and the infusion set insertion site at least every 3 days or after exposure to temperatures that exceed 98.6°F (37°C). An insulin lispro 3 mL cartridge used in the D-Tron pumps should be discarded after 7 days, even if it still contains insulin lispro. However, as with other external insulin pumps, the infusion set should be replaced and a new infusion set insertion site should be selected at least every 3 days. 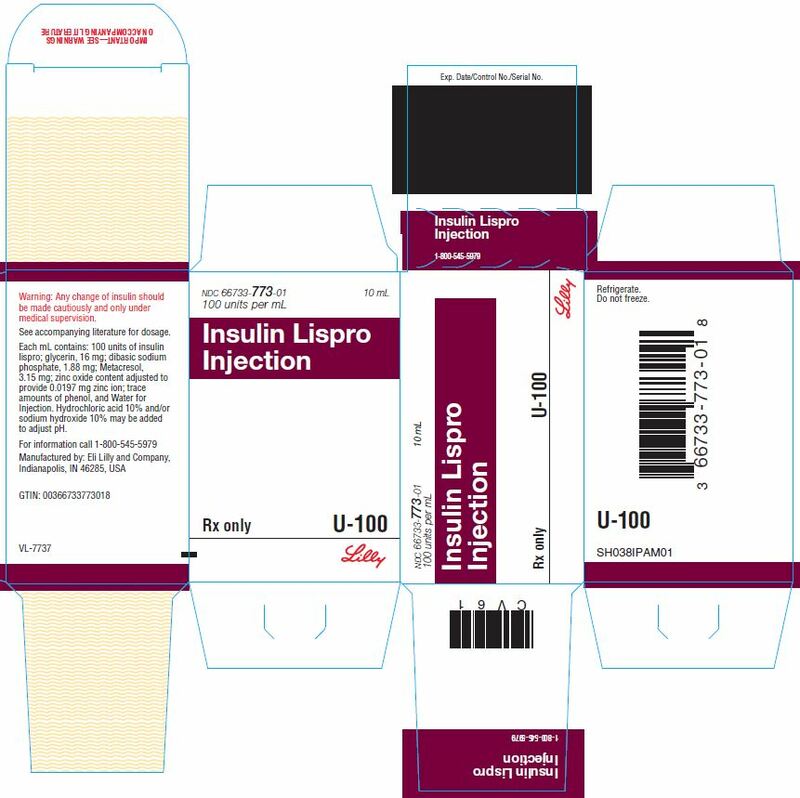 Diluted Insulin Lispro U-100 for Subcutaneous Injection — Diluted insulin lispro may remain in patient use for 28 days when stored at 41°F (5°C) and for 14 days when stored at 86°F (30°C). Do not dilute insulin lispro contained in a cartridge or insulin lispro used in an external insulin pump. Accidental mix-ups between basal insulin products and other insulins, particularly rapid-acting insulins, have been reported. To avoid medication errors between insulin lispro and other insulins, instruct patients to always check the insulin label before each injection. Do not transfer insulin lispro U-200 from the Insulin Lispro KwikPen to a syringe. The markings on the insulin syringe will not measure the dose correctly and can result in overdosage and severe hypoglycemia [see Dosage and Administration (2.1) and Warnings and Precautions (5.3)]. Severe, life-threatening, generalized allergy, including anaphylaxis, can occur with insulin products, including insulin lispro. If hypersensitivity reactions occur, discontinue insulin lispro; treat per standard of care and monitor until symptoms and signs resolve [see Adverse Reactions (6.1)]. Insulin lispro is contraindicated in patients who have had hypersensitivity reactions to insulin lispro or any of its excipients [see Contraindications (4)]. All insulin products, including insulin lispro, cause a shift in potassium from the extracellular to intracellular space, possibly leading to hypokalemia. Untreated hypokalemia may cause respiratory paralysis, ventricular arrhythmia, and death. Monitor potassium levels in patients at risk for hypokalemia if indicated (e.g., patients using potassium-lowering medications, patients taking medications sensitive to serum potassium concentrations). Thiazolidinediones (TZDs), which are peroxisome proliferator-activated receptor (PPAR)-gamma agonists, can cause dose-related fluid retention, particularly when used in combination with insulin. Fluid retention may lead to or exacerbate heart failure. Patients treated with insulin, including insulin lispro, and a PPAR-gamma agonist should be observed for signs and symptoms of heart failure. If heart failure develops, it should be managed according to current standards of care, and discontinuation or dose reduction of the PPAR-gamma agonist must be considered. Malfunction of the insulin pump or insulin infusion set or insulin degradation can rapidly lead to hyperglycemia and ketoacidosis. Prompt identification and correction of the cause of hyperglycemia or ketosis is necessary. Interim subcutaneous injections with insulin lispro may be required. Patients using continuous subcutaneous insulin infusion pump therapy must be trained to administer insulin by injection and have alternate insulin therapy available in case of pump failure [see How Supplied/Storage and Handling (16.2) and Patient Counseling Information (17.7)]. Because clinical trials are conducted under widely varying designs, the adverse reaction rates reported in one clinical trial may not be easily compared with those rates reported in another clinical trial, and may not reflect the rates actually observed in clinical practice. The frequencies of Treatment-Emergent Adverse Events during insulin lispro clinical trials in patients with type 1 diabetes mellitus and type 2 diabetes mellitus are listed in the tables below. The risk of hypoglycemia associated with insulin lispro use may be increased when co-administered with antidiabetic agents, salicylates, sulfonamide antibiotics, monoamine oxidase inhibitors, fluoxetine, pramlintide, disopyramide, fibrates, propoxyphene, pentoxifylline, ACE inhibitors, angiotensin II receptor blocking agents, and somatostatin analogs (e.g., octreotide). Dose adjustment and increased frequency of glucose monitoring may be required when insulin lispro is co-administered with these drugs. The glucose lowering effect of insulin lispro may be decreased when co-administered with corticosteroids, isoniazid, niacin, estrogens, oral contraceptives, phenothiazines, danazol, diuretics, sympathomimetic agents (e.g., epinephrine, albuterol, terbutaline), somatropin, atypical antipsychotics, glucagon, protease inhibitors, and thyroid hormones. Dose adjustment and increased frequency of glucose monitoring may be required when insulin lispro is co-administered with these drugs. The glucose lowering effect of insulin lispro may be increased or decreased with co-administered with beta-blockers, clonidine, lithium salts, and alcohol. Pentamidine may cause hypoglycemia, which may sometimes be followed by hyperglycemia. Dose adjustment and increased frequency of glucose monitoring may be required when insulin lispro is co-administered with these drugs. The signs and symptoms of hypoglycemia [see Warnings and Precautions (5.3)] may be blunted when beta-blockers, clonidine, guanethidine, and reserpine are co-administered with insulin lispro. Pregnancy Category B. All pregnancies have a background risk of birth defects, loss, or other adverse outcome regardless of drug exposure. This background risk is increased in pregnancies complicated by hyperglycemia and may be decreased with good metabolic control. It is essential for patients with diabetes or history of gestational diabetes to maintain good metabolic control before conception and throughout pregnancy. In patients with diabetes or gestational diabetes insulin requirements may decrease during the first trimester, generally increase during the second and third trimesters, and rapidly decline after delivery. Careful monitoring of glucose control is essential in these patients. Therefore, female patients should be advised to tell their physicians if they intend to become, or if they become pregnant while taking insulin lispro. Although there are limited clinical studies of the use of insulin lispro in pregnancy, published studies with human insulins suggest that optimizing overall glycemic control, including postprandial control, before conception and during pregnancy improves fetal outcome. In a combined fertility and embryo-fetal development study, female rats were given subcutaneous insulin lispro injections of 5 and 20 units/kg/day (0.8 and 3 times the human subcutaneous dose of 1 unit/kg/day, based on units/body surface area, respectively) from 2 weeks prior to cohabitation through Gestation Day 19. There were no adverse effects on female fertility, implantation, or fetal viability and morphology. However, fetal growth retardation was produced at the 20 units/kg/day-dose as indicated by decreased fetal weight and an increased incidence of fetal runts/litter. In an embryo-fetal development study in pregnant rabbits, insulin lispro doses of 0.1, 0.25, and 0.75 unit/kg/day (0.03, 0.08, and 0.24 times the human subcutaneous dose of 1 unit/kg/day, based on units/body surface area, respectively) were injected subcutaneously on Gestation days 7 through 19. There were no adverse effects on fetal viability, weight, and morphology at any dose. It is unknown whether insulin lispro is excreted in human milk. Because many drugs are excreted in human milk, caution should be exercised when insulin lispro is administered to a nursing woman. Use of insulin lispro is compatible with breastfeeding, but women with diabetes who are lactating may require adjustments of their insulin doses. Insulin lispro is approved for use in children for subcutaneous daily injections [see Clinical Studies (14)]. 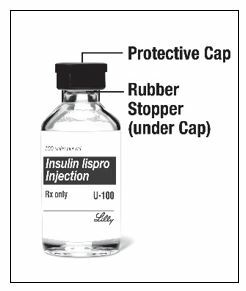 Only the U-100 formulation of insulin lispro is approved for use in children by continuous subcutaneous infusion in insulin pumps. Insulin lispro has not been studied in pediatric patients younger than 3 years of age. Insulin lispro has not been studied in pediatric patients with type 2 diabetes. As in adults, the dosage of insulin lispro must be individualized in pediatric patients based on metabolic needs and results of frequent monitoring of blood glucose. Of the total number of subjects (n=2834) in eight clinical studies of insulin lispro, twelve percent (n=338) were 65 years of age or over. The majority of these had type 2 diabetes. HbA1c values and hypoglycemia rates did not differ by age. Pharmacokinetic/pharmacodynamic studies to assess the effect of age on the onset of insulin lispro action have not been performed. Patients with renal impairment may be at increased risk of hypoglycemia and may require more frequent insulin lispro dose adjustment and more frequent blood glucose monitoring [see Clinical Pharmacology (12.3)]. Patients with hepatic impairment may be at increased risk of hypoglycemia and may require more frequent insulin lispro dose adjustment and more frequent blood glucose monitoring [see Clinical Pharmacology (12.3)]. Insulin lispro injection is a rapid-acting human insulin analog used to lower blood glucose. Insulin lispro is produced by recombinant DNA technology utilizing a non-pathogenic laboratory strain of Escherichia coli. Insulin lispro differs from human insulin in that the amino acid proline at position B28 is replaced by lysine and the lysine in position B29 is replaced by proline. Chemically, it is Lys(B28), Pro(B29) human insulin analog and has the empirical formula C257H383N65O77S6 and a molecular weight of 5808, both identical to that of human insulin. Insulin lispro is a sterile, aqueous, clear, and colorless solution. Each milliliter of insulin lispro U-100 contains insulin lispro 100 units, 16 mg glycerin, 1.88 mg dibasic sodium phosphate, 3.15 mg Metacresol, zinc oxide content adjusted to provide 0.0197 mg zinc ion, trace amounts of phenol, and Water for Injection. Insulin lispro has a pH of 7.0 to 7.8. The pH is adjusted by addition of aqueous solutions of hydrochloric acid 10% and/or sodium hydroxide 10%. Each milliliter of insulin lispro U-200 contains insulin lispro 200 units, 16 mg glycerin, 5 mg tromethamine, 3.15 mg Metacresol, zinc oxide content adjusted to provide 0.046 mg zinc ion, trace amounts of phenol, and Water for Injection. Insulin lispro has a pH of 7.0 to 7.8. The pH is adjusted by addition of aqueous solutions of hydrochloric acid 10% and/or sodium hydroxide 10%. Regulation of glucose metabolism is the primary activity of insulins and insulin analogs, including insulin lispro. Insulins lower blood glucose by stimulating peripheral glucose uptake by skeletal muscle and fat, and by inhibiting hepatic glucose production. Insulins inhibit lipolysis and proteolysis, and enhance protein synthesis. Insulin lispro has been shown to be equipotent to human insulin on a molar basis. One unit of insulin lispro has the same glucose-lowering effect as one unit of regular human insulin. Studies in normal volunteers and patients with diabetes demonstrated that insulin lispro has a more rapid onset of action and a shorter duration of activity than regular human insulin when given subcutaneously. The time course of action of insulin and insulin analogs, such as insulin lispro, may vary considerably in different individuals or within the same individual. The parameters of insulin lispro activity (time of onset, peak time, and duration) as designated in Figure 1 should be considered only as general guidelines. The rate of insulin absorption, and consequently the onset of activity are known to be affected by the site of injection, exercise, and other variables [see Warnings and Precautions (5.2)]. Figure 1: Blood Glucose Levels After Subcutaneous Injection of Regular Human Insulin or Insulin Lispro (0.2 unit/kg) Immediately Before a High Carbohydrate Meal in 10 Patients with Type 1 Diabetesa. Insulin lispro was not mutagenic in the following genetic toxicity assays: bacterial mutation, unscheduled DNA synthesis, mouse lymphoma, chromosomal aberration and micronucleus assays. In standard biological assays in fasted rabbits, 0.2 unit/kg of insulin lispro injected subcutaneously had the same glucose-lowering effect and had a more rapid onset of action as 0.2 unit/kg of regular human insulin. The safety and efficacy of insulin lispro U-100 were studied in children, adolescent, and adult patients with type 1 diabetes (n=789) and adult patients with type 2 diabetes (n=722). A 12-month, randomized, parallel, open-label, active-controlled study was conducted in patients with type 1 diabetes to assess the safety and efficacy of insulin lispro (n=81) compared with Humulin® R [insulin human injection (100 units per mL)] (n=86). Insulin lispro was administered by subcutaneous injection immediately prior to meals and Humulin R was administered 30 to 45 minutes before meals. Humulin® U [ULTRALENTE® human insulin (rDNA origin) extended zinc suspension] was administered once or twice daily as the basal insulin. There was a 2- to 4-week run-in period with Humulin R and Humulin U before randomization. Most patients were Caucasian (97%). Forty-seven percent of the patients were male. The mean age was 31 years (range 12 to 70 years). Glycemic control, the total daily doses of insulin lispro and Humulin R, and the incidence of severe hypoglycemia (as determined by the number of events that were not self-treated) were similar in the two treatment groups. There were no episodes of diabetic ketoacidosis in either treatment group. b Severe hypoglycemia refers to hypoglycemia for which patients were not able to self-treat. A 6-month randomized, crossover, open-label, active-controlled study was conducted in insulin-treated patients with type 2 diabetes (n=722) to assess the safety and efficacy of insulin lispro for 3 months followed by Humulin R for 3 months or the reverse sequence. Insulin lispro was administered by subcutaneous injection immediately before meals and Humulin R was administered 30 to 45 minutes before meals. Humulin® N [NPH human insulin (rDNA origin) isophane suspension] or Humulin U was administered once or twice daily as the basal insulin. All patients participated in a 2- to 4-week run-in period with Humulin R and Humulin N or Humulin U. Most of the patients were Caucasian (88%), and the numbers of men and women in each group were approximately equal. The mean age was 58.6 years (range 23.8 to 85 years). The average body mass index (BMI) was 28.2 kg/m2. During the study, the majority of patients used Humulin N (84%) compared with Humulin U (16%) as their basal insulin. The reductions from baseline in HbA1c and the incidence of severe hypoglycemia (as determined by the number of events that were not self-treated) were similar between the two treatments from the combined groups (see Table 6). An 8-month, crossover study of adolescents with type 1 diabetes (n=463), aged 9 to 19 years, compared two subcutaneous multiple-dose treatment regimens: insulin lispro or Humulin R, both administered with Humulin N (NPH human insulin) as the basal insulin. Insulin lispro achieved glycemic control comparable to Humulin R, as measured by HbA1c (see Table 7), and both treatment groups had a comparable incidence of hypoglycemia. In a 9-month, crossover study of prepubescent children (n=60) with type 1 diabetes, aged 3 to 11 years, insulin lispro administered immediately before meals, insulin lispro administered immediately after meals and Humulin R administered 30 minutes before meals resulted in similar glycemic control, as measured by HbA1c, and incidence of hypoglycemia, regardless of treatment group. b Severe hypoglycemia refers to hypoglycemia that required glucagon or glucose injection or resulted in coma. To evaluate the administration of insulin lispro U-100 via external insulin pumps, two open-label, crossover design studies were performed in patients with type 1 diabetes. One study involved 39 patients, ages 19 to 58 years, treated for 24 weeks with insulin lispro or regular human insulin. After 12 weeks of treatment, the mean HbA1c values decreased from 7.8% to 7.2% in the insulin lispro-treated patients and from 7.8% to 7.5% in the regular human insulin-treated patients. Another study involved 60 patients (mean age 39, range 15 to 58 years) treated for 24 weeks with either insulin lispro or buffered regular human insulin. After 12 weeks of treatment, the mean HbA1c values decreased from 7.7% to 7.4% in the insulin lispro-treated patients and remained unchanged from 7.7% in the buffered regular human insulin-treated patients. Rates of hypoglycemia were comparable between treatment groups in both studies. A randomized, 16-week, open-label, parallel design, study of children and adolescents with type 1 diabetes (n=298) aged 4 to 18 years compared two subcutaneous infusion regimens administered via an external insulin pump: insulin aspart (n=198) or insulin lispro U-100 (n=100). These two treatments resulted in comparable changes from baseline in HbA1c and comparable rates of hypoglycemia after 16 weeks of treatment (see Table 8). Infusion site reactions were similar between groups. b Severe hypoglycemia refers to hypoglycemia associated with central nervous system symptoms and requiring the intervention of another person or hospitalization. 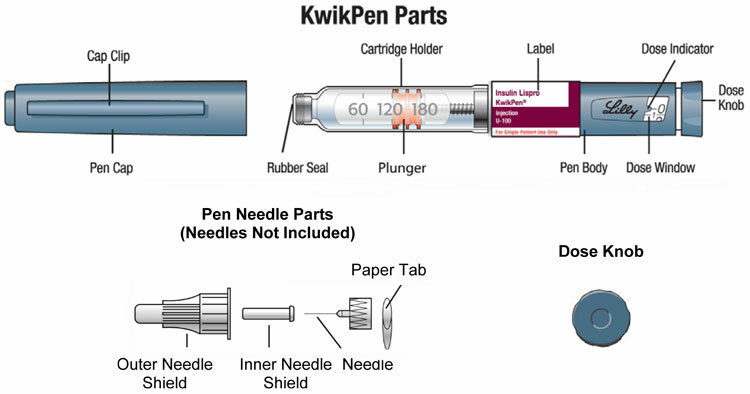 Each prefilled KwikPen is for use by a single patient. 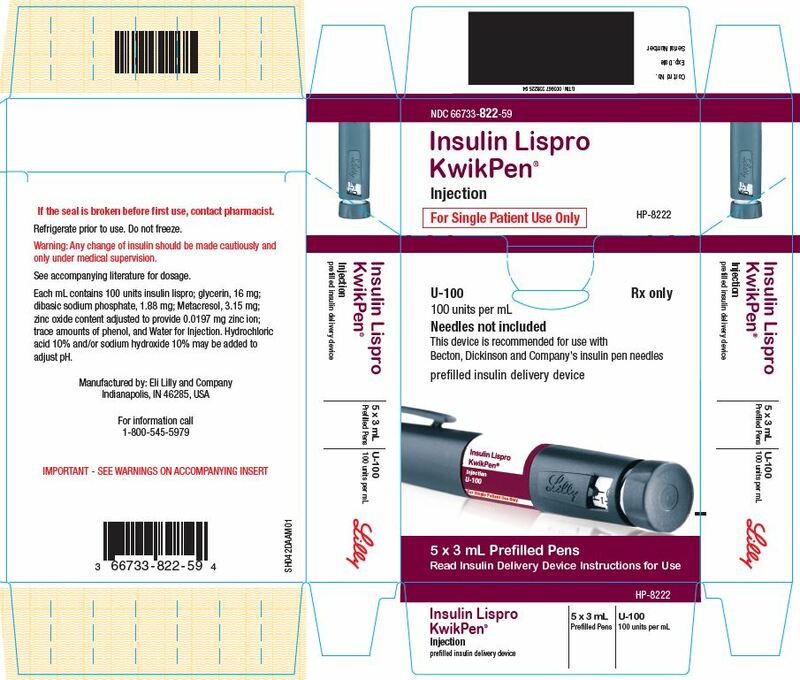 Insulin Lispro KwikPens must never be shared between patients, even if the needle is changed. Patients using insulin lispro vials must never share needles or syringes with another person. 28 days, Do not refrigerate. Diluted insulin lispro U-100 for Subcutaneous Injection — insulin lispro may be diluted with Sterile Diluent for insulin lispro for subcutaneous injection. Diluting one part insulin lispro to nine parts diluent will yield a concentration one-tenth that of insulin lispro (equivalent to U-10). Diluting one part insulin lispro to one part diluent will yield a concentration one-half that of insulin lispro (equivalent to U-50). Infusion bags prepared with insulin lispro U-100 are stable when stored in a refrigerator (2° to 8°C [36° to 46°F]) for 48 hours and then may be used at room temperature for up to an additional 48 hours [see Dosage and Administration (2.2)]. Advise patients that they must never share an Insulin Lispro KwikPen, cartridge, or reusable pen compatible with Lilly 3 mL cartridges with another person, even if the needle is changed. Advise patients using insulin lispro vials not to share needles or syringes with another person. Sharing poses a risk for transmission of blood-borne pathogens. Instruct patients on self-management procedures including glucose monitoring, proper injection technique, and management of hypoglycemia and hyperglycemia, especially at initiation of insulin lispro therapy. Instruct patients on handling of special situations such as intercurrent conditions (illness, stress, or emotional disturbances), an inadequate or skipped insulin dose, inadvertent administration of an increased insulin dose, inadequate food intake, and skipped meals. Instruct patients on the management of hypoglycemia. Advise patients that hypersensitivity reactions have occurred with insulin lispro. Inform patients on the symptoms of hypersensitivity reactions [see Warnings and Precautions (5.5)]. Inform patients that insulin lispro U-200 contains 2 times as much insulin in 1 mL as insulin lispro U-100. Inform patients that the Insulin Lispro U-200 KwikPen dose window shows the number of units of insulin lispro U-200 to be injected and that no dose conversion is required. Instruct patients to NOT transfer insulin lispro U-200 from the Insulin Lispro KwikPen to a syringe. The markings on the syringe will not measure the dose correctly and this can result in overdosage and severe hypoglycemia. Instruct patients to NOT mix insulin lispro U-200 with any other insulin. Patients using external pump infusion therapy should be trained appropriately. The following insulin pumps have been tested in insulin lispro clinical trials conducted by Eli Lilly and Company. Disetronic® H-Tron® plus V100, D-Tron® and D-Tronplus® with Disetronic Rapid infusion sets2MiniMed® Models 506, 507 and 508 and Polyfin® infusion sets3Insulin lispro is recommended for use in pump systems suitable for insulin infusion such as MiniMed, Disetronic, and other equivalent pumps. 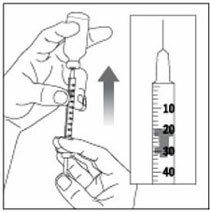 Before using insulin lispro in a pump system, read the pump label to make sure the pump is indicated for continuous delivery of fast-acting insulin. Insulin lispro is recommended for use in any reservoir and infusion sets that are compatible with insulin and the specific pump. Please see recommended reservoir and infusion sets in the pump manual. Do not use insulin lispro U-200 in an external insulin pump. To avoid insulin degradation, infusion set occlusion, and loss of the preservative (metacresol), insulin in the reservoir should be replaced at least every 7 days; infusion sets and infusion set insertion sites should be changed at least every 3 days.Insulin exposed to temperatures higher than 98.6°F (37°C) should be discarded. The temperature of the insulin may exceed ambient temperature when the pump housing, cover, tubing or sport case is exposed to sunlight or radiant heat. Infusion sites that are erythematous, pruritic, or thickened should be reported to the healthcare professional, and a new site selected because continued infusion may increase the skin reaction or alter the absorption of insulin lispro. Pump or infusion set malfunctions or insulin degradation can lead to rapid hyperglycemia and ketosis. This is especially pertinent for rapid acting insulin analogs that are more rapidly absorbed through skin and have a shorter duration of action. Prompt identification and correction of the cause of hyperglycemia or ketosis is necessary. Problems include pump malfunction, infusion set occlusion, leakage, disconnection or kinking, and degraded insulin. Less commonly, hypoglycemia from pump malfunction may occur. 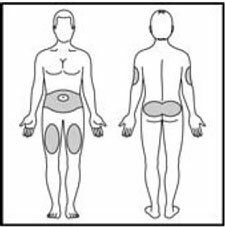 If these problems cannot be promptly corrected, patients should resume therapy with subcutaneous insulin injection and contact their healthcare professionals [see Dosage and Administration (2.2) and How Supplied/Storage and Handling (16.2)]. 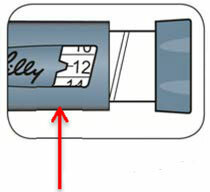 1 3 mL cartridge is for use in Eli Lilly and Company's HumaPen® Luxura® HD insulin delivery device, and Disetronic D-TRON® and D-TRON® Plus pumps. KwikPen® HumaPen®, HumaPen® Luxura® and HumaPen® Luxura® HD are trademarks of Eli Lilly and Company. 2 Disetronic®, H-Tron®, D-Tron®, and D-Tronplus® are registered trademarks of Roche Diagnostics GmbH. 3 MiniMed® and Polyfin® are registered trademarks of MiniMed, Inc.
Other product and company names may be the trademarks of their respective owners. Manufactured by: Eli Lilly and Company, Indianapolis, IN 46285, USACopyright © 1996, 2018, Eli Lilly and Company. All rights reserved. Patient InformationInsulin LisproInjectionWhat is insulin lispro?Insulin lispro is a man-made fast-acting insulin used to control high blood sugar in adults and children with diabetes mellitus. It is not known if insulin lispro is safe and effective in children younger than 3 years of age or when used to treat children with type 2 diabetes mellitus. Who should not use insulin lispro?Do not use insulin lispro if you:are having an episode of low blood sugar (hypoglycemia). Have an allergy to insulin lispro or any of the ingredients in insulin lispro. Before using insulin lispro, tell your healthcare provider about all of your medical conditions, including if you:have kidney or liver problems.take any other medicines, especially ones commonly called TZDs (thiazolidinediones). Have heart failure or other heart problems. If you have heart failure, it may get worse while you take TZDs with insulin lispro. Have any other medical conditions. Some medical conditions can affect your insulin needs and your dose of insulin lispro. Are pregnant or plan to become pregnant. Talk to your healthcare provider if you are pregnant or plan to become pregnant. You and your healthcare provider should decide about the best way to manage your diabetes while you are pregnant. Are breastfeeding or plan to breastfeed. It is not known if insulin lispro passes into your breast milk. You and your healthcare provider should decide if you will use insulin lispro while you breastfeed. That come with your insulin lispro. Do not share your Insulin Lispro KwikPen, cartridges, reusable pen compatible with Lilly 3 mL cartridges, or syringes with other people, even if the needle has been changed. You may give other people a serious infection or get a serious infection from them.Use insulin lispro exactly as your healthcare provider tells you to. Insulin lispro starts acting fast, so inject it up to 15 minutes before or right after you eat a meal. Know the type and strength of insulin you use. Do not change the type of insulin you use unless your healthcare provider tells you to. The amount of insulin and the best time for you to take your insulin may need to change if you take a different type of insulin. Check your blood sugar levels. Ask your healthcare provider what your blood sugars should be and when you should check your blood sugar level. What should I avoid while using insulin lispro?While using insulin lispro do not:Drive or operate heavy machinery, until you know how insulin lispro affects you. What are the possible side effects of insulin lispro?Insulin lispro may cause serious side effects, including:low blood sugar (hypoglycemia). Signs and symptoms that may indicate low blood sugar include:dizziness or light-headedness, sweating, confusion, headache, blurred vision, slurred speech, shakiness, fast heartbeat, hunger, anxiety, irritability, or mood changes.Your insulin lispro dose may need to change because of a:change in level of physical activity or exercise, weight gain or loss, change in diet, illness. Serious allergic reactions (whole body allergic reaction). Get medical help right away, if you have any of these symptoms of an allergic reaction:a rash over your whole body, trouble breathing, a fast heartbeat, sweating, feel faint. Treatment with TZDs and insulin lispro may need to be adjusted or stopped by your healthcare provider if you have new or worse heart failure. The most common side effects of insulin lispro include:low blood sugar (hypoglycemia), reactions at the injection site, skin thickening or pits at the injection site (lipodystrophy), itching (pruritis), rash. These are not all the possible side effects of insulin lispro. General information about the safe and effective use of insulin lispro.Medicines are sometimes prescribed for purposes other than those listed in a Patient Information leaflet. You can ask your pharmacist or healthcare provider for information about insulin lispro that is written for health professionals. Do not use insulin lispro for a condition for which it was not prescribed. Do not give or share insulin lispro with other people, even if they also have diabetes. It may harm them. KwikPen® is a registered trademark of Eli Lilly and Company. Manufactured by: Eli Lilly and Company, Indianapolis, IN 46285, USAFor more information, call 1-800-545-5979. Copyright © 1996, 2018, Eli Lilly and Company. All rights reserved. Read the Instructions for Use before you start taking insulin lispro and each time you get a new insulin lispro vial. There may be new information. This information does not take the place of talking to your healthcare provider about your medical condition or your treatment. 1 sharps container for throwing away used needles and syringes. See “Disposing of used needles and syringes” at the end of these instructions. Preparing your insulin lispro doseWash your hands with soap and water. Check the insulin lispro label to make sure you are taking the right type of insulin. This is especially important if you use more than 1 type of insulin. Insulin lispro should look clear and colorless. Do not use insulin lispro if it is thick, cloudy, or colored, or if you see lumps or particles in it. Do not use insulin lispro past the expiration date printed on the label or 28 days after you first use it. Always use a new syringe or needle for each injection to help ensure sterility and prevent blocked needles. Do not reuse or share your syringes or needles with other people. 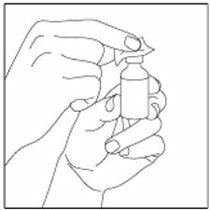 You may give other people a serious infection or get a serious infection from them.Step 1:If you are using a new vial, pull off the plastic Protective Cap, but do not remove the Rubber Stopper. Step 2:Wipe the Rubber Stopper with an alcohol swab. Step 3:Hold the syringe with the needle pointing up. Pull down on the Plunger until the tip of the Plunger reaches the line for the number of units for your prescribed dose. Step 4:Push the needle through the Rubber Stopper of the vial. Step 5:Push the Plunger all the way in. This puts air into the vial. 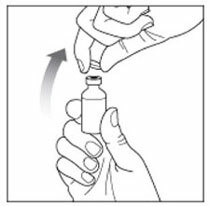 Step 6:Turn the vial and syringe upside down and slowly pull the plunger down until the tip is a few units past the line for your prescribed dose. If there are air bubbles, tap the syringe gently a few times to let any air bubbles rise to the top. Step 7:Slowly push the Plunger up until the tip reaches the line for your prescribed dose.Check the syringe to make sure that you have the right dose. Step 8:Pull the syringe out of the vial's Rubber Stopper. If you use insulin lispro with NPH insulin:NPH insulin is the only type of insulin that can be mixed with insulin lispro. Do not mix insulin lispro with any other type of insulin. Insulin lispro should be drawn up into the syringe first, before you draw up your NPH insulin. Talk to your healthcare provider if you are not sure about the right way to mix insulin lispro and NPH insulin. Give your injection right away. Giving your insulin lispro Injection with a syringeInject your insulin exactly as your healthcare provider has shown you. Insulin lispro starts acting fast, so give your injection within 15 minutes before or right after you eat a meal. 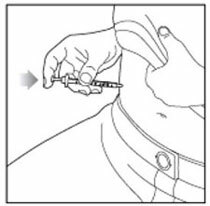 Step 9:Choose your injection site.Insulin lispro is injected under the skin (subcutaneously) of your stomach area (abdomen), buttocks, upper legs or upper arms.Wipe the skin with an alcohol swab. Let the injection site dry before you inject your dose. Step 10:Insert the needle into your skin. 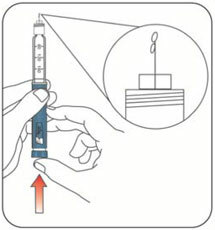 Step 11:Push down on the Plunger to inject your dose.The needle should stay in your skin for at least 5 seconds to make sure you have injected all of your insulin dose. 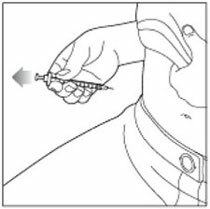 Step 12:Pull the needle out of your skin.You may see a drop of insulin at the needle tip. This is normal and does not affect the dose you just received. If you see blood after you take the needle out of your skin, press the injection site with a piece of gauze or an alcohol swab. Do not rub the area. Giving your insulin lispro using an insulin pumpChange your insertion site every 3 days. Do not dilute or mix insulin lispro with any other type of insulin in your insulin pump. When your sharps disposal container is almost full, you will need to follow your community guidelines for the right way to dispose of your sharps disposal container. There may be state or local laws about how you should throw away used needles and syringes. For more information about safe sharps disposal, and for specific information about sharps disposal in the state that you live in, go to the FDA's website at:http://www.fda.gov/safesharpsdisposal. How should I store insulin lispro?All unopened insulin lispro vials:Store all unopened vials in the refrigerator. Do not freeze. Do not use if it has been frozen. Unopened vials can be used until the expiration date on the carton and label, if they have been stored in the refrigerator. Unopened vials should be thrown away after 28 days, if they are stored at room temperature. After insulin lispro vials have been opened:Store opened vials in the refrigerator or at room temperature below 86°F (30°C) for up to 28 days. Keep vials away from heat and out of direct light. Throw away all opened vials after 28 days of use, even if there is insulin left in the vial. General information about the safe and effective use of insulin lisproKeep insulin lispro vials, syringes, needles, and all medicines out of the reach of children. Always use a new syringe or needle for each injection. Do not reuse or share your syringes or needles with other people. You may give other people a serious infection or get a serious infection from them.If you have any questions or problems with your insulin lispro, contact Lilly at 1-800-Lilly-Rx (1-800-545-5979) or call your healthcare provider for help. 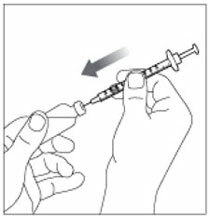 Instructions for UseInsulin Lispro KwikPen®Injection100 units/mL, 3 mL penRead the Instructions for Use before you start taking insulin lispro and each time you get another KwikPen®. There may be new information. This information does not take the place of talking to your healthcare provider about your medical condition or your treatment. Do not share your Insulin Lispro KwikPen with other people, even if the needle has been changed. You may give other people a serious infection or get a serious infection from them.Insulin Lispro KwikPen (“Pen”) is a disposable prefilled pen containing 300 units of insulin lispro. You can give yourself more than 1 dose from the Pen. Each turn (click) of the Dose Knob dials 1 unit of insulin. You can give from 1 to 60 units in a single injection. If your dose is more than 60 units, you will need to give yourself more than 1 injection. The Plunger only moves a little with each injection, and you may not notice that it moves. The Plunger will only reach the end of the cartridge when you have used all 300 units in the Pen. Preparing your PenWash your hands with soap and water. Check your Pen to make sure you are taking the right type of insulin. This is especially important if you use more than 1 type of insulin. Do not remove the Pen Label. 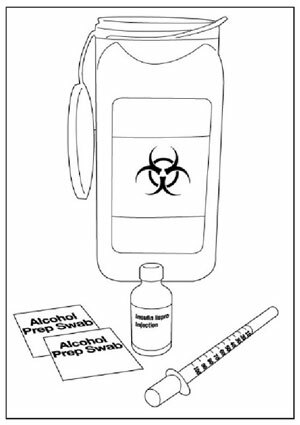 Wipe the Rubber Seal with an alcohol swab.Step 2:Check the liquid in the Pen.Insulin lispro should look clear and colorless. Do not use if it is cloudy, colored, or has particles or clumps in it. Step 3:Select a new Needle.Pull off the Paper Tab from the Outer Needle Shield. Step 4:Push the capped Needle straight onto the Pen and twist the Needle on until it is tight. Step 5:Pull off the Outer Needle Shield. Do not throw it away. Priming your PenPrime before each injection.Priming your Pen means removing the air from the Needle and Cartridge that may collect during normal use and ensures that the Pen is working correctly. Step 6:To prime your Pen, turn the Dose Knob to select 2 units. Step 7:Hold your Pen with the Needle pointing up. Tap the Cartridge Holder gently to collect air bubbles at the top. If you do not see insulin, repeat priming steps 6 to 8, no more than 4 times. If you still do not see insulin, change the Needle and repeat priming steps 6 to 8. Selecting your doseYou can give from 1 to 60 units in a single injection. Use a new Needle for each injection and repeat the priming step. The Pen dials 1 unit at a time. The Dose Knob clicks as you turn it. The even numbers (for example, 12) are printed on the dial. The odd numbers, (for example, 25) after the number 1, are shown as full lines. Get a new Pen and inject the full dose. It is normal to see a small amount of insulin left in the Pen that you can not inject. Giving your injectionInject your insulin as your healthcare provider has shown you. 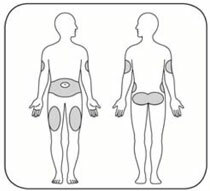 Step 10:Choose your injection site.Insulin lispro is injected under the skin (subcutaneously) of your stomach area, buttocks, upper legs or upper arms. Step 11:Insert the Needle into your skin. 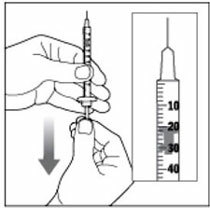 Continue to hold the Dose Knob in and slowly count to 5 before removing the Needle.Do not try to inject your insulin by turning the Dose Knob. 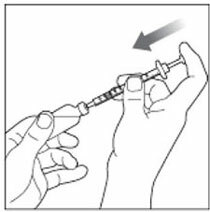 You will not receive your insulin by turning the Dose Knob.Step 12:Pull the Needle out of your skin.A drop of insulin at the Needle tip is normal. It will not affect your dose. If you still do not think you received the full amount you dialed for your injection, do not start over or repeat the injection. Monitor your blood glucose as instructed by your healthcare provider. 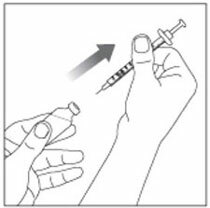 If you normally need to give 2 injections for your full dose, be sure to give your second injection.The Plunger only moves a little with each injection, and you may not notice that it moves.If you see blood after you take the Needle out of your skin, press the injection site lightly with a piece of gauze or an alcohol swab. Do not rub the area.After your injectionStep 13:Carefully replace the Outer Needle Shield. Step 15:Replace the Pen Cap by lining up the Cap Clip with the Dose Indicator and pushing straight on. Disposing of Pens and NeedlesPut your used needles in a FDA-cleared sharps disposal container right away after use. Do not throw away (dispose of) loose needles in your household trash. Storing your PenUnused PensStore unused Pens in the refrigerator at 36°F to 46°F (2°C to 8°C). Do not freeze your insulin. Do not use if it has been frozen. In-use PenStore the Pen you are currently using at room temperature [up to 86°F (30°C)]. Keep away from heat and light. Throw away the Insulin Lispro Pen you are using after 28 days, even if it still has insulin left in it. General information about the safe and effective use of your PenKeep your Pen and needles out of the reach of children.Do not use your Pen if any part looks broken or damaged. TroubleshootingIf you can not remove the Pen Cap, gently twist the cap back and forth, and then pull the cap straight off. If you have any questions or problems with your Insulin Lispro KwikPen, contact Lilly at 1-800-LillyRx (1-800-545-5979) or call your healthcare provider for help. This Instructions for Use has been approved by the U.S. Food and Drug Administration.KwikPen®is a registered trademark of Eli Lilly and Company. Manufactured by: Eli Lilly and Company Indianapolis, IN 46285, USACopyright © 2007, 2018, Eli Lilly and Company. All rights reserved. Insulin Lispro KwikPen meets the current dose accuracy and functional requirements of ISO 11608-1:2014.